When it comes to visual appeal, Thailand’s stunning attractions don’t end with its natural scenery. In fact, a traditional Thai wedding is infused with elegant flourishes and stylish additions – many of which can be incorporated into your own wedding ceremony. When it comes to fashion, a growing number of Western brides and grooms are choosing to infuse their wedding day apparel with stunning Thai adornments. Whether you’re heading to the Kingdom to celebrate your wedding on the beach or within the landscaped grounds of a private villa, here’s how to incorporate the Thailand’s signature style into your wedding day ensemble. From orchids to frangipani, Thailand is filled with fragrant blossoms and sensual blooms. If you’re getting married at a private villa in Koh Samui and Phuket, you’ll notice that the grounds are likely to perfumed by the scent of this gorgeous native flowers. 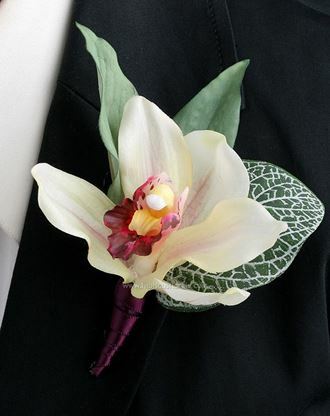 You can take flower power one step further by crafting orchid boutonnieres for the groom, best man and ushers. Not only is this traditional wedding touch a nice way to make your guests of honour feel special, but it’s a great way to incorporate traditional Thai-ness into your ceremony. Your villa manager will be able to put you in touch with a skilled florist who will be able to hand the practical side of making the boutonnieres. If you’re planning to say your vows on the beach, with the sea breeze in your hair and the sand between your toes, then let your buttonholes be inspired by the seaside setting. In fact, if you’re planning a rustic seaside themed décor scheme, then mini starfish buttonholes could provide a fun, yet elegant flourish. 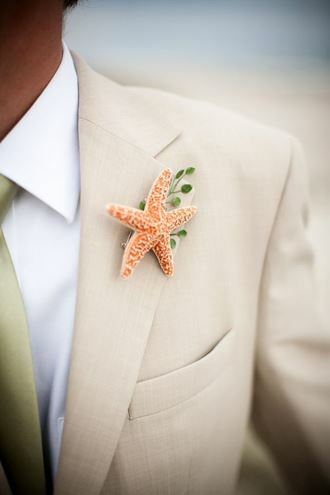 We love the simplicity of this particular starfish buttonhole, which has been incorporated alongside a sprig of greenery for a contrasting pop of colour. There’s no reason why the seaside theme should be limited to gentlemen. 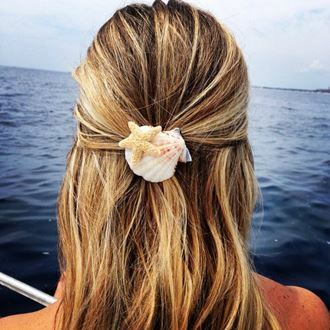 In fact, shell and starfish can be crafted into the most beautiful hair accessories for the bride and her bridesmaids. If you have a creative streak, you could collect the shells from the very same beach where you’re getting married and make the accessories up yourself. Failing that, you’ll find that many markets across Koh Samui and Phuket have an array of quality shell accessories for you to choose from on your big day. If you’re going for a traditional Thai look, then gold jewellery is an essential addition to any bridal ensemble. Traditionally, many Thai bridal gowns are embellished with gold and brightly coloured gemstones, and even gold lace mesh and threads. Gold jewellery, including necklaces, bracelets, bangles, belts and brooches could all be worn to give your outfit a uniquely Thai edge. If you really want to push the boat out, you could get your own gold jewellery made up at one of Thailand’s expert precious metal artisans – many of which can be found in Bangkok. That way, your accessories will be both traditionally Thai and bespoke. Traditionally, Thai wedding gowns are made from soft, luxurious silk. If you’re a bride who is a stickler for tradition, then wearing silk on your big day could be a great way to channel an authentic sense of Thai-ness. Plus, silk will glide smoothly across your skin, helping you to remain cool in the tropical heat. Many Thai gowns feature off-the-shoulder silhouettes, which you might be keen to incorporate into your gown as a less obvious nod to traditional Thai style.